Fathers’ Day is coming up. Many children like to make a card to show their fathers how much they care about them. Now a child can give their father a certificate to show him how much they appreciate him. The Father’s Day Award certificate can be downloaded from our site. This template has decorative colors and designs. There is also a place where the template can be customized. After the words World’ Best Dad the child can type in the name of their father. There is even a “from” line where the child can put their name. This certificate can then be printed. This template is great for an entire class to make customized awards for their father. 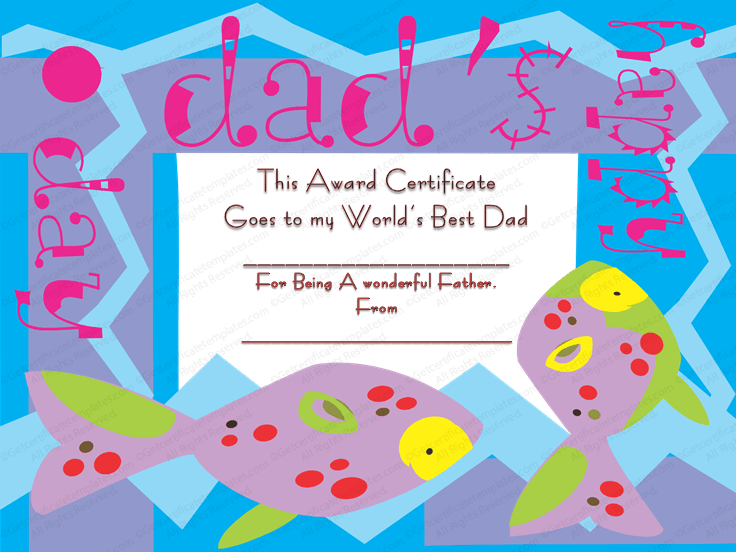 The certificate award will impress any father and is easy to personalize. The template can be filled in over and over again so each child can show their dad how much they care.